Most high level business people are very guarded and super planned. That’s one of the reasons why a surprising, creative and immersive experience can be transformative not only for us regular folk- but for the leaders of Fortune 100 companies and above. 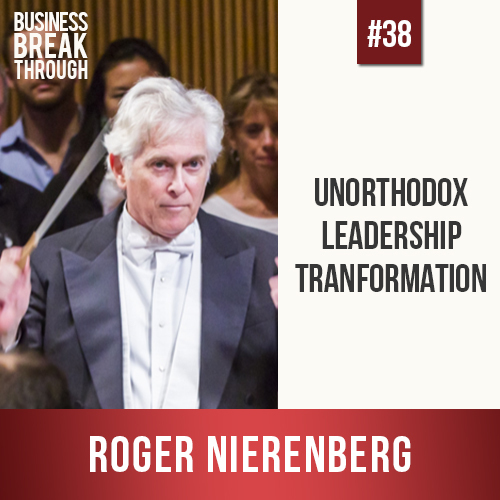 Roger Nierenberg took his love for classical music, and his desire to make it more widely listened to and created an incredible leadership transformation experience for leaders around the world. 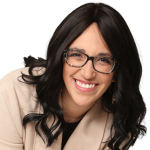 We also discuss the benefits of the Japanese Kaizen system for business systems and how to scale your small business from stage 2 to 3. Roger Nierenberg is an orchestral conductor, leadership consultant and founder of The Music Paradigm, an engaging and unforgettable learning experience for any organization. Members of the organization are participants as well as audience members, and are seated within a live professional orchestra. The participant’s attention is drawn to fascinating and unexpected organizational dynamics within the orchestra, and they realize that The Music Paradigm is much more than a riveting demonstration. As an orchestral conductor, was dismayed at the societal drift away from classical music and wanted to attract more people to its beauty. Realized that organizational leaders were the best agents to introduce others to classical music as they have power, money and influence on their teams. Simultaneously developed a method that used music as a metaphor to teach and influence people in a meaningful and non-threatening way. Was engaged by a CEO to present his leadership transformation technique by conducting a live orchestra at a business meeting. Grew his client base by networking with music directors who led him to business consultants. Within a year of his first performance, was delivering sessions to Fortune 100 companies. Was so successful that one participant described the experience as the outstanding moment of his career. When trying to drive organizational change, it can be difficult as most people don’t enjoy being told how to improve and so they naturally resist these messages. Delivering the criticism in a creative way that is not personal allows the message to penetrate. People like to be in control of the situation which is why so many business meetings are scripted beforehand. Working spontaneously and removing the feeling of security and control puts people in a slightly vulnerable position where they are more open to absorbing important messages. When someone tells you an idea, you are borrowing it; when you figure it out yourself, you own it. Kaizen, a Japanese business management approach, involves writing down every step of organizational process. Then, start with the last step and work backwards to figure out the fastest and most efficient route to this end result. Roger struggles with the opportunity that his performances present. He has a strong influence on people during his performances, but then he leaves and is not there to help people act on their momentary inspiration. How can he remain involved to bring the inspiration he gives to action? Furthermore, Roger wants to measure how much influence he is having on others so that he is aware of whether he is achieving his goals. Stage 1: Developing and implementing a solid business model. Stage 2: Stabilizing core competencies and making sure that the business is working well. Stage 3: Scaling the business, finding more and different people and services. Roger is currently at Stage 2, moving up to Stage 3. His business is working well, but he needs to scale up to take advantage of the opportunity he faces. He is in the process of doing so by developing new products and services that he can leave behind to help turn inspiration into practical results and a stronger appreciation for classical music. He also needs to get more and different people on board. Due to his many years of experience, he has many people who have been participants in his performances and remember the experience warmly. He can therefore call on a consulting company that has experienced his work to help him figure out the metrics so that he can focus on what he does best; the inspiration and education.